The Workforce Innovation and Opportunity Act (WIOA) was signed into law on July 22, 2014, and became effective July 1, 2015. WIOA supersedes the Workforce Investment Act of 1998 and amends the Adult Education and Family Literacy Act, the Wagner-Peyser Act, and the Rehabilitation Act of 1973. WIOA is designed to help both jobseekers and businesses: WIOA addresses the needs of jobseekers through establishing a workforce system that helps them access employment, education, training and support services to succeed in the labor market; WIOA addresses businesses’ needs by matching them to the skilled workers they need to compete in the global economy. DLLR is committed to providing accessible digital materials for persons with disabilities. For assistance or to ask questions related to accessibility, please contact DWDAL's Communications and Outreach Unit. DLLR and Senior Service America, Inc. The inclusion of these key programs, in combination, will ensure that Maryland effectively leverages its existing resources to deliver outstanding customer service to workers and businesses that are vital to Maryland’s economic growth and prosperity. 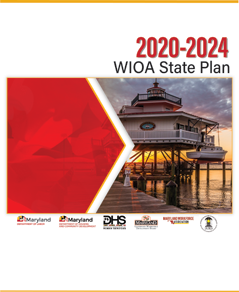 Key partners from these state agencies as well as representatives from the Governor’s Workforce Development Board and local workforce development areas, pursuant to the Governor’s charge, worked together to ensure that Maryland is poised to develop a WIOA compliant workforce system. The Plan was approved by USDOL and the federal agencies implementing WIOA. In July 2016, National Skills Coalition highlighted Maryland’s Combined State Workforce Plan.